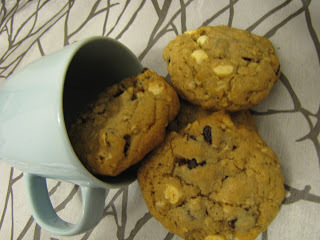 ½ cup (or more) white chocolate chips, but really any chocolate chips could work here. In a small bowl combine the flour, baking soda, salt and cinnamon and set aside. Soften the butter in a large bowl (don’t melt it, but you can soften it up with a few seconds in the microwave). Add the brown and white sugar to the butter and mix together until well combined. Add in the vanilla and the egg to the butter/sugar mixture and beat until creamy and light. Slowly add in the flour mixture and keep stirring. If the dough is super sticky you can add a bit more flour. Once there are no remnants of flour lingering around the bowl, add in the oatmeal, raisins, craisins and white chocolate chips and stir to incorporate all the ingredients. Stir until well mixed, or just until there are little bits of the good stuff throughout the dough. Bake at 325F for 10-12 minutes. Until the edges of each cookie are browning, but the middle is still soft and doughy. Wait a minute to transfer the warm cookie to the cooling rack, as they might try to fall apart. Be strong, and don’t let them. Makes about 2 dozen, depending on how big you make the cookies. Remember, if you make them smaller, they won’t need as long in the oven. Enjoy them while they last. I always find these don’t last very long in my kitchen…!